BRAIN-storming – Jenny and Jonathan Got Married! People should come together for . . . zombies. Last year, a Facebook friend asked for suggestions of activities for the kids living in her community. Ever since, I have BRAIN-stormed for this. And then I remembered the trip that I took to Virginia several years ago in order to spend time with two of my sisters. We sisters needed a fun activity. Fun for both ourselves and also for my toddler nephew. The Fredericksburg Zombie Walk fit this need. The website that I linked explains the event so that I don’t have to. The Mean Mommy Club of Fredericksburg VA organized the walk. They charged no admission but requested food pantry donations. The walk began at a downtown park and eventually circled back to that park. The Fredericksburg Zombie Walk lured my sisters and I to downtown Fredericksburg. We bought lunch in a downtown restaurant. We walked around a historic neighborhood. Then, we watched zombies for two hours. And I thought: One of the local towns should have a Zombie Walk! 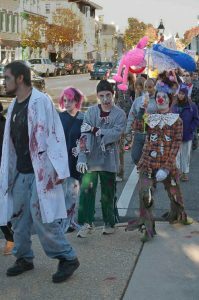 Now, I know that the Fredericksburg Zombie Walk actually went on hiatus a few years ago. Such an event presents unique complications. So here’s my back-up idea: community movie night on a large screen in a town park. The movie could even be about zombies. What ideas did you BRAIN-storm?